Given the precedent of Dan Morgan’s Decca Phase 4 box review, in which a series of eight reviews of 5 CDs was published over successive weeks, I have decided to follow suit in a similar way, except that each review will take in 8 CDs, with the last one mopping up the remainder of the box. Let’s open with what we have. Firstly a solid box, with 186 page booklet with full discographical information in three languages, English, German, and French. Second, there are 53 CDs, largely singles but some – like the Bloch String Quartets, gatefold twofers or, exceptionally in the case of Boyd Neel’s Handel, a 3-CD set. Third, the covers are the miniaturised LP covers beloved by reissue programmes, but the reverse of the card is not. Some companies prefer total miniaturisation with reproductions of the LP sleeve notes, a policy usually followed by irate critical commentary from myopic hacks. Decca has simplified things by merely providing bare track details and timings. For some of the discs – I must stress the word ‘some’ – a link to a pdf of the original liner note is provided. But this is by far the exception. In the first tranche of eight discs under review, for example, only two links are given; CDs 6 and 8. It’s true that the remainder is largely standard rep, but I feel it’s something a critic ought to note. A fourth point: these are by no means straight LP reproductions, as is so often the case with resultant short playing time. Whilst the first disc shows Ansermet’s famous Petrouchka LP sleeve, we actually find that The Rite of Spring is included as a ‘bonus’. In fact there are bonuses almost throughout, with the relevant additional LP sleeve appearing, small scale, on the back of the relevant CD card. A fifth point is that there is a handy alphabetical index of the works at the front of the booklet, with the relevant CD number attached to make navigation a little easier. Six, where discs are making ‘first international Decca CD release’ they are duly noted. I would add that I have never been convinced I understand what that really means in the context of the internet. 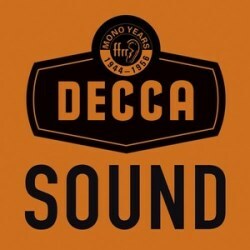 Seven, the booklet essays are ‘The Decca Sound’ by Michael Gray and ‘Developing an Artist Roster, Building A Catalogue’ by Raymond McGill, along with a nice series of original Decca advertisements. Eight, the remastering has been carried out by three named members of The Audio Archiving Company Limited – namely, Paschal Byrne, Craig Thompson and Edward Weston. The initial sampling of the first eight discs has been very satisfactory. Some transfers differ very little, if at all, from those on the Original Masters or Decca Heritage marques. High level hiss is maintained in the interests of openness and there’s tremendous clarity. Nine, this is clearly not a complete edition of the Decca FFRR (Full Frequency Range Recording) series of discs. It includes solely orchestral and instrumental recordings; vocal and opera will appear later. Indeed, the very first released set under this advanced recording system was Sidney Beer’s mid-1944 recording of Tchaikovsky’s Fifth Symphony — not included in this box. Whilst the set does include discs from that vintage – Dennis Brain and the Amadeus in Mozart, for instance – the majority of things date from later. Having reached my tenth point, I should note that many of the recordings have been reissued on CD over the last twenty years, sometimes multiply. You will recognise a good number of them and will have heard them or know the recordings by repute. Others, however, are considerably rarer and have not appeared since their original LP incarnation. This leads onto the tricky question of whether this is the set for you, given the foregoing. Lastly, I am going to keep my comments on each disc brief and as near to the point as I can manage. Where I give alternative transfer information, it is certainly not intended to be complete but is rather meant to be illustrative. Ernest Ansermet had been a Decca artist since the late 1920s and once the War was over and an A & R policy took shape he and his Suisse Romande Orchestra were entrusted with a swathe of FFRR recording projects. Decca’s first LP was given to him. Here it is, Petrouchka from November 1949, taking pole position in this box set. It still bites. Somm’s transfer (SOMM027) is cut lower and has a warmer though more veiled sound; less ‘Decca bright’ and immediate. It was coupled in that reissue with Ansermet’s Rossini-Respighi La Boutique Fantasque whereas Decca has sensibly added the 1950 The Rite of Spring, by no means a stranger to the Decca reissue programme; typically and famously analytical, objectified, and full of clarity in Ansermet’s hands. Historians of such things will know that Ansermet recorded both works in FFRR but on 78rpm discs in London back in 1946. These are not included in the box. The second disc emphasises Ansermet’s famous reportorial strengths, not least in ballet and in French music. He was certainly not the first conductor to get to grips with Roussel’s deliciously haunting Le Festin de l’araignée on disc – the composer had beaten him, for one, and so had Walter Staram – but his was the first recording to have the technical advances necessary fully to bring out its moments of diaphanous writing. The delightful Petite Suite was also on the LP but the bonus material here comes from another LP entirely and consists of all-Ravel, Le Tombeau de Couperin and the orchestral version of Valses nobles et sentimentales. All were recorded in Victoria Hall, Geneva – the Ravel over a year before the Roussel. It wasn’t all the Suisse Romande. Here he also directs the Paris Conservatoire in Rachmaninov and Dukas. The Isle of the Dead was included in the Ansermet volume in the Great Conductors of the Twentieth Century series. It was also in the Australian Eloquence series. It has a powerfully individual approach though he was not one to cultivate bass-up sonorities, preferring to clarify rather than saturate the string choirs. Meanwhile the Dukas and the Debussy – along with Danse Macabre and the Sorcerer’s Apprentice were all reissued back in 2004 on Testament (SBT 1324). Doubtless it’s true that this is the first international Decca release of Le Péri, as noted in the booklet, but given the existence of the Testament reissue over a decade ago I’m not sure that’s such a pressing claim. There’s a photograph in the booklet of Ansermet and Argenta enjoying a joke in a café. If Decca’s A&R policy saw the older man mine a certain kind of repertoire, strongly based on Stravinsky, and French ballet and quite a lot more besides, Argenta was something of an Iberian specialist. The old Record Guide in the 1950s was extremely snooty about Arbos’ orchestration of Iberia and it’s hardly a fashionable undertaking even now but the playing of the Paris Conservatoire Orchestra and the direction are alike full of flourish and spirit. Just as unbuttoned are the Turina dances, a rich repository of colour. Both of these pieces can be found in Decca’s Original Masters box devoted to Argenta. Similarly the ‘filler’, Roger Désormière’s 1951 Poulenc Les Biches, has been reissued by Testament, a fruitful source of Decca monos for over a decade now. Both Haydn symphonies were reissued in 2004 on a Decca single in their Decca Heritage marque. The company bagged the Vienna Philharmonic in 1950 and embarked on a prestigious series of recordings in the city at roughly the same time that the more hard-pressed and cash-strapped Vienna Symphony were recording for whoever would pay them. These have long been admired as fine example of Münchinger’s art and whilst the strings sound a bit shrill, the Vienna winds come up trumps. The coupling is Backhaus’ recording of the Emperor Concerto with Clemens Krauss. This was around in 2008 in Decca Historic coupled with the Fourth Concerto, and is still the best place to appreciate Backhaus’ imperatives in this work, notwithstanding his live concert broadcasts, at least two of which I have reviewed. Extremely long playing time for this disc. Aha. Something novel at last. This is the first disc in the series that might have escaped notice even though it has been reissued. A word of warning: it seems cut very high, so turn down your volume a bit otherwise you risk neighbour-wars. Baranovič was born in Yugoslavia in 1894 and educated in Zagreb and Vienna. A conductor and pedagogue he directs the Belgrade Philharmonic in his 1924 ballet suite The Gingerbread Heart. It’s an example of Croatian folklore, colourful, exciting, dramatic and a touch crude, with hints of Petruchka along the way. Lhotka was Czech, born in Prague, but who spent much of his adult life in Yugoslavia. He directs the Zagreb Opera Orchestra in The Devil in the Village, first performed in 1935. Less lavishly orchestrated it’s closer to Smetana. Woozy and delightfully syncopated in spots it is alluringly performed. Both these high octane pieces are hugely welcome in this set. A pdf of the LP sleeve note can be accessed online. LP playing time. Nothing desperately novel here, though it’s welcome all the same. As with all the CDs discussed thus far the sound quality is excellent. If you have the relevant Decca Original Masters box devoted to van Beinum you inevitably have all three works. His famous 78 rpm set of the Concerto for Orchestra has stood the test of time and the September 1948 sound quality holds up well. Curzon has a small role in Pijper’s Symphony No.3, an uneasy work that trades off stasis against violence. Much different is Diepenbrock’s beautiful Marsyas suite. Here we reach British music. Kingsway Hall is the venue, 1955 the year, and Bliss the composer. All three of these pieces have been reissued by Decca over the years. The Colour Symphony and Introduction and Allegro have also appeared on Dutton CDLX 9818, and the Concerto on Beulah, in which guise I reviewed it. The transfer of the last named has quite a bit of hiss but also a strong sense of immediacy whilst this Decca transfer is quieter and smoother and fractionally less immediate. Bliss’ tempi are highly convincing – Handley took very similar approach, though David Lloyd-Jones didn’t – and the playing is bracing but sensitive. Finally, note that BBC Radio Classics released a 1968 performance of Campoli and Bliss performing the Concerto – slower in the first two movements, quicker in the long finale. Postscript: The next selection of discs will introduce quite a bit of Boult, van Beinum’s Bartók and Britten, Campoli in Lalo, Elgar and Kreisler, Anthony Collins’ Walton, Elgar and VW and chamber music played by the Griller and Amadeus quartets.